Macon Candy: See You on the Sweet Side: A Tisket, A Tasket . . .
. . . That would be Astropop shots in a basket. Mom, Bright Blue, Just Jill (Mechel McKinley) and Lisa Mac (McLendon) weren't so successful with First Friday's first-ever Adult Easter Egg Hunt. Turns out, there were some eager beavers amongst the fun-loving bunnies and the hide and seek was well over by 5:05 p.m., just as Mom and the girls were sliding into their premeditated parallel parking spots. So with their sulking shoulders and defeated demeanors, the girls sideled up to the bar at BJ's, threw down their empty baskets and ordered a round of beer bottles. But lo and behold, BJ's was onto the games people play, and when the girls weren't looking, staged a new Easter egg hunt every hour, much to their delight. 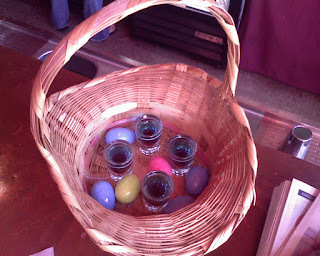 Coicidentally, one egg often yielded four shots, which even more coincidentally tasted like candy. The best was the Black Betty (Jack, butterscotch, coffee liquor) whose egg was found nested between the bartender's bosom. Just Jill is just fearless. Even though it was an early First Friday for Mom, it was a good beginning to a full weekend of family. We all gathered together to send Georgie Girl (Georgeanna Walden) off to the City of Angels. Even though Mom and lil sis are hell on heels when face-to-face, Auntie Georgie doesn't have a bigger fan than her big sister. Georgie Girl called from Alabama and said she cried from the get-go at her personlized playlist. She should be in Texas by now . . . Godspeed, girl, is what Mom has been saying the past couple of days as G.G. drives her Penske across the county. Godspeed. We all have high hopes for Georgie Girl. We loved having her here among us, but wish her well in the City of Angels....well, perhaps they'll change the name now that she's there! Keep us posted on her Journey! We won't stop believin' she is destined for stardom!